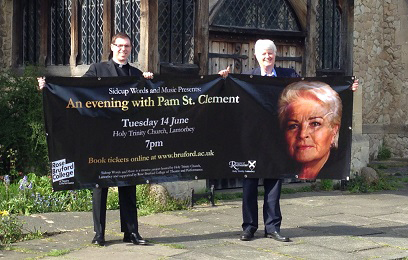 EastEnders legend Pam St. Clement will be returning to Sidcup as part of a popular cultural initiative between Holy Trinity Church, Lamorbey and Rose Bruford College of Theatre and Performance. The popular actor will talk about her time living and studying in Sidcup, as a student at Rose Bruford College, and her subsequent career which includes playing the role of Pat Butcher for over 25 years. Now in its second year, Sidcup Words & Music celebrates cultural figures connected to Sidcup. In 2015 a capacity audience attended an event with the illustrator Sir Quentin Blake.